James V. Hansen was a Republican member of the United States House of Representatives representing Utah. 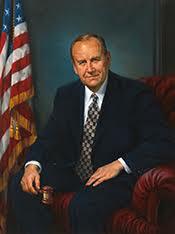 He was elected in 1980 and served from January 3, 1981, until his retirement on January 3, 2003. He had previously served in the Utah House of Representatives from 1973 to 1980; he was Speaker of the House the last year of his term. Hansen ran for governor of the state of Utah in 2004 but was defeated at the Republican convention by Jon Huntsman, Jr.. He was appointed commissioner on the 2005 Base Realignment and Closure Commission. He was born on August 14, 1932, in Salt Lake City. He served in the United States Navy from 1951 to 1955. He then earned a business degree from the University of Utah. After graduation he was elected to the Farmington City Council (Utah) and worked as an insurance agent and real estate agent. Part of US-89 in Weber County, Utah, was named the James V. Hansen Highway and the federal building in Ogden, Utah, named in his honor in 2004. Hansen married Ann Burgoyne and they have five children. He is a member of The Church of Jesus Christ of Latter-day Saints. This page was last edited on 5 July 2018, at 13:33.